When 808 State first rolled onto the British club scene in 1988, the acid house phenomenon was beginning to seep into the nation’s underground culture. 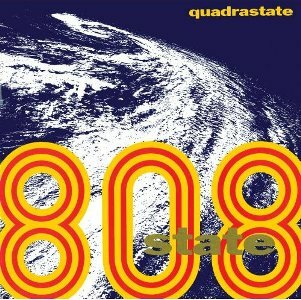 After the innovations of Detroit and Chicago, it was time for the UK to give things a go, and 808 State were just one of many producers of the time to pick up the baton. Taking their name from a ubiquitous drum machine of the period, they went on to release a string of albums that took on the house sound and treated it to some subtle but serious refraction. And Quadrastate is just one of the results of that time. Merely an EP at the time of its release, cut-offs and alternative mixes are thrown into the equation here to bring us a spatchcock album that many will now be hearing for the first time. Its most obvious claim to fame, of course, is album opener Pacific State, one of the defining tracks of eighties house and probably the stand-out track of 808’s long reign in the field of electronics. But this is merely the starting point for a bracing journey around the formulas of the house sound. Quadrastate’s interest to us now is probably largely historical, but its re-release is a good chance to look again at an era of English house music that is all too easily forgotten – while the scene’s US masters are perennially revered. What made the album vexing last time around was its brevity, so the addition of more tracks to fill out the mix is welcome. Two are mere reworkings from the original that sit awkwardly at the album’s end – State Ritual Scam and Let Yourself Go (D50 Mix) – and could easily have remained on the cutting room floor. But the five other exercises offer us a fresh look at the state of mind of the band at what was effectively their creative peak. Let Yourself Go, the band’s first single, is a mish-mash of 303 bass and wild orchestral screechings, and serves well as a picture of two musics – disco and house – on a virtual collision course. With its clicking, plucking rhythms, it has an urgency that almost suggests a band in a hurry. And the pizzicato plucking is of course the very essence of Gerald Simpson’s sound. It is, too, his musical ghost that lingers over the album, even on tracks he did not write, such as the fractured kettledrum house of Firecracker and the moody robotics of Techclock. Elsewhere there is the subterranean melancholy of In Yolk, a track that anticipates much of the ambient scene that was shortly to follow. Quiet, nebulous, intense, it’s difficult to see how it was left off the album first time around. Indeed, so much of the album has the sound of pioneers grasping at the edge of new ideas. Where they went wrong – as, at times, on the discordant State Ritual – they nevertheless quite clearly pointed the way for others like LFO and Aphex Twin to follow. And with Pacific State, here in its original, least developed incarnation, the band succeeded in welding disparate sounds together – saxophone and keyboards – that surely no-one has even attempted to do since. The track is in a way typical of the album, sounding raw and almost unfinished – as though in fact Quadrastate was nothing more than a stop gap for other things. Of course, Pacific State was eventually filled out into a much more layered piece, and so too was the 808 sound. Perhaps, though, much was lost in the process in between. The magic of the early records is almost reliant on their rudimentary sound, built around 808s and 303s – instruments that themselves are the musical embodiment of that era. And this affection for the early work is clearly the reason behind Rephlex’s decision to re-release 808’s early back catalogue again now. After Newbuild and Prebuild, Quadrastate sees the completion of the triptych, and perhaps the completion of Richard D. James’ mission to get the band heard by a new audience. The man who tore apart 808’s Flow Coma for a new generation probably has these early records in his blood, and his decision to take on and release these albums is telling about both the man and his music. Now the only thing to do is pick up a copy and spot the links with SAW 1985-92.
picked this one up today. It’s great to see this expanded reissue finish off the Rephlex series of early 808 State material. I’m really digging some of the extras – “In Yolk”, as you pointed out, is a really beautiful little number that sets up for Global Communication and the Orb. This review reminded me of how much this is the pivotal moment for 808 State, where they went from the frantic acid lines of Newbuild to the more ambient, pad-inhabited techno that framed their ZTT years. Speaking of ZTT, they’ll be reissuing the first four 808 State albums on August 8 (which is 08/08/08, of course), with bonus discs. Exciting to see those get reissued, and I’ll be interested to see what they put on the bonus discs. Great news about the reissues. I thought that had been dropped or something as there rumours of this when Prebuild came out, and possibly even before that. I most definitely will get 90 and Ex:El, which is, to this day, my favourite 808 State album, and the album that also made me appreciate Bjork’s voice for the first time.